Road conditions may change quickly, and the information on this site might not be accurate or timely. Please drive with caution and consult other sources of road and weather information when planning your trip. Western Forest Products will have no liability whatsoever regarding the content on this site or any damage that might be caused by relying upon that content. #GoldRiver: Please be advised of upcoming road construction operations at approximately 16-19.5km on the Head Bay FSR. Operations will be commencing Tuesday July 24, 2018 and ongoing until August 15. Expect short delays, please plan travel accordingly. http://bit.ly/2uUUd5l. Check Environment Canada for weather alerts, and be familiar with the local forecast. 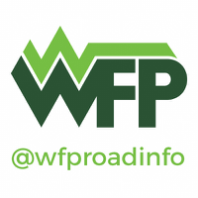 Check current road conditions on Twitter using @WFPRoadInfo and the #GoldRiver hashtag or the feed on this website. Cellphone service is very limited and unreliable on this road. Issues like flooding and heavy industrial activity could end or significantly slow down your trip. Ensure your vehicle is in good working order, has a full tank of fuel and is equipped with an inflated spare tire and the tools needed to change that tire. Carry water, snacks, warm clothing, blankets and road safety gear to keep you healthy during an unexpected breakdown, flooding, blown over trees or industrial activity causing delays. Always drive with your headlights on. Even in the daytime. Follow the speed limit and drive to the conditions. Traveling at high speeds on industrial roads puts everyone at risk and won't make a big difference to your overall travel time. Expect to see heavy equipment and logging trucks. Bridges are single lane so please take your time and yield to logging trucks. If the road is dusty and you have limited visibility please wait for the dust to settle before continuing.